Our vision is a future where capitalism means Conscious Capitalism. One day, business will be and be seen as the greatest force for good. 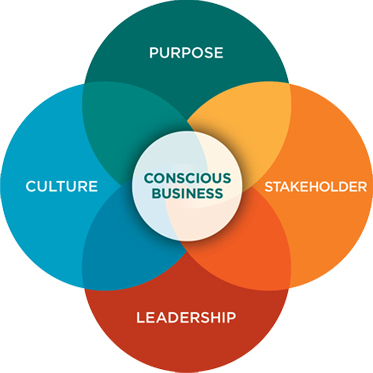 Every business will operate with a sense of higher purpose, integrate the interests of all stakeholders, develop and elevate conscious leaders, and create a conscious culture. To make the foundational tenets of Conscious Capitalism accessible and actionable by EVERY business. Co-creating tools and resources to facilitate members’ Conscious Capitalism journeys. We are originators, aggregators, and distributors of the best practices, the best minds, and the most open hearts in business. We grow the movement and enable transformation in the following ways. We share the success stories of conscious businesses that are changing the world and through those stories, inspire the growth of Conscious Capitalism. We enable and support our members’ journeys by introducing them to methodologies, ideas, tools and resources from organisations and people that offer solutions to facilitate members’ Conscious Capitalism journeys. We cultivate a vibrant and active community of people who share a common vision of conscious business. Through events and online communities we connect collaborators, supporters and like-minded people. We meet the needs of the present without compromising those of the future. Do I value and prioritise my personal physical, mental, emotional and spiritual wellbeing? Are our expectations of our CCANZ colleagues realistic? Do we give each other the support that enables long-term, effective contribution? Do we offer realistic solutions that enable organisations to adopt more sustainable practices? Are we operating CCANZ as a financially sustainable organisation with the resources needed to fulfil its mission? Are we advocating for regenerative capitalism that creates a more sustainable society and environment? Are we using social, environmental and financial measures to evaluate our impact? We work together to achieve more than we can alone. Am I contributing to CCANZ and inviting contribution from my colleagues? Am I behaving with authenticity, honesty, compassion and curiosity? Do I assume everyone is good, unique and of equal worth? Are we wholeheartedly supporting one another, generously sharing our time, skills and knowledge? Do we value the diversity within our team and community and offer equal opportunity for all to contribute? Are we crowdsourcing best practices, tools and resources from our community and providing a platform for sharing them? Are we partnering with values and purpose-aligned individuals and organisations that help deliver conscious business transformation? We drive change and enable change-makers to create a better way to conduct business. Am I adopting practices that help me become happier and more effective in all aspects of my life? Are we working together effectively to unlock transformational opportunities? Are we inspiring the masses, connecting the community, providing crowd-sourced resources and trustworthy guidance to enable transformation? Does the work we do elevate humanity and our global environment? Am I taking responsibility for my beliefs, thoughts and actions? Am I meeting my responsibilities and commitments? Do we ask for help when necessary so we can deliver on our promises? Do we treat failure as an opportunity to learn, improve, innovate and evolve? Are we holding each other responsible for our behaviour and deliverables; our results and their impact? Are we encouraging accountability measures within the 4 CC tenets? to be influential and effective change-makers. Am I empowering myself and others to contribute to the change we want to see? Are we providing permission, support, tools and resources to our CCANZ colleagues to empower them to make decisions, execute and deliver? Are we connecting and empowering our members and partners to share their knowledge, resources, stories and expertise to enable the co-creation of Conscious Capitalism? Are we empowering our members to make a positive impact within their organisations, with their stakeholders and with the wider community?